Dental Implant Problems and Treatment | Orange County Periodontists | Ajay B. Setya, DDS, MSD Robert C. Hirst, DDS, MS Christen S. Bergman, DDS., MS.
We will sometimes see patients who received Implants in the past and are now having problems with them. Although the vast majority of implant placements are successful, a very small percentage of them develop complications that need special treatment or replacement with a new implant. Dr. Setya is a highly trained and experienced specialist in the placement and care of dental implants, including the diagnosis and treatment of implant complications. He uses advanced-technology diagnostic tools to determine the exact problem with a failing implant, and delivers the treatments that will be most effective to restore the implant to a stable and healthy state. In rare instances where the implant has completely failed and cannot be saved, Dr. Setya can place a new implant. In this case he will explain the treatment needed to do so and will answer all your questions. Swolen or painful gums can be a sign of a problem with your dental implant. The main causes of implant complications are poor original placement of the implant or crown, the implant has not integrated with the surrounding bone, or the implant has become infected. Implants placed in the wrong position or where there is inadequate bone support can become unstable. Normal biting and chewing forces on a wrongly placed implant can cause the implant to become loose or even fall out. Unstable implants are also more susceptible to infection. In rare instances the implant is placed in a good position but the bone fails to fuse to the implant and anchor it firmly in the jaw. This is another source of instability and has the same consequences as a wrongly positioned implant. Most infection around an implant is a special category of gum disease known as peri-implantitis. Peri-implantitis has set in when there is infection of the gums combined with bone loss around the implant. Peri-implantitis can be the result of a number of different factors, including smoking, poor oral hygiene, health problems such as diabetes, a compromised immune system, and dental crown cement leaking under the gum line. It can also more rarely be the result of undue pressure being put on the implant due to bite misalignment, an allergic reaction to the implant or the implant being rejected by the body. 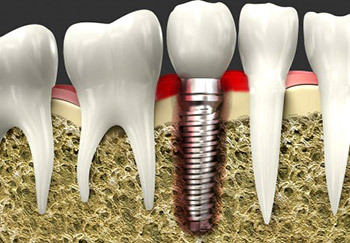 If left untreated, the progressive bone loss and infection can cause the implant to fail. Sometimes final restorations such as crowns, bridges or dentures, are immediately loaded onto the implants at the time of implant placement. When the implant is stable enough to handle this, immediate placement of the final restoration saves time and money and there is no problem. But if the restoration is placed before the implant is stable enough to easily handle the added pressure from chewing and biting, the implant can become further destabilized and can fail.